helps you harness the power of the sun. One source of power that never fails is the light of the sun. Whether you’re dealing with a power outage or conserving energy, the SUN OVEN® enables you can capture the power of the sun to cook without fuel. The Ultra WhiteTM transparent Glass is 25% thicker than the glass on prior SUN OVENS® for increased shatter resistance and improved insulation. 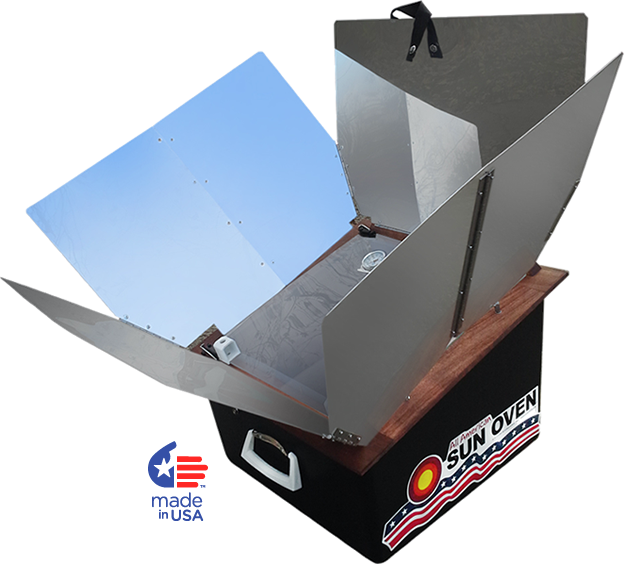 The All American SUN OVEN® is equipped with a dual-purpose leveling rack which hangs inside the oven and swings freely to prevent spilling of food in a pot on the rack. The dual-purpose leveling rack can also be set on the floor of the oven to increase the usable area inside the SUN OVEN®. The SUN OVEN® Cookbook is a specialty cookbook featuring 40 of our favorite recipes, techniques and tricks of the trade to inspire your tastebuds as you focus the sun on delicious meals. Outstanding product, very well engeneered! This is my second Sun Oven and while my first oven is still in operation the improvements you have made in your new ovens, like a more stable support leg and a simple way for solar aliment, makes operation effortless. While their not inexpensive, there worth every dollar. Good job folks!